INOX new line of refrigerated counters, with innovative function. 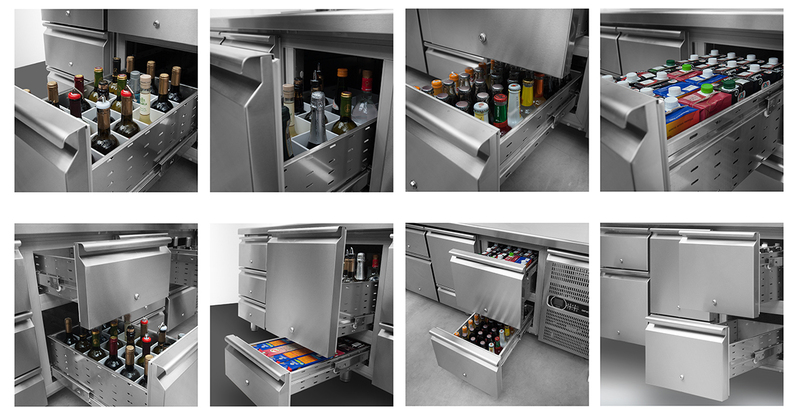 The refrigerators are constructed completely in stainless steel AISI 304 18/10, with rounded internal angles and corners at the bottom and at the ceiling, through to meet the highest hygiene standards to avoid the microbes and clean easier.. Self closing doors all in stainless steel AISI 304 18/10, insulated with ecological polyurethane, with handles made in stainless steel AISI 304 18/10 andwith magnetic clipped gaskets with hygiene standards, easily replaceable. Legs in stainless steel, adjustable in height - to give 150mm-, with special PVC inside, which does’ t allow the electricity to pass through, making it safer.Refrigeration system ventilated for rapid cooling and an even temperature distribution. Automatic defrost and automatic water evaporation. That the new GINOX line of refrigerated counters have been designed with a modular structure. This makes it easy to dismantle or assemble parts of the refrigerator, without having any technical knowledge and without using any special tools. The middle and the horizontal columns can be unclenched and removed in one step, providing easy access in order to modify it by placing drawers instead of doors and vise versa. With the same easiness one can pull out the slide guides, the insert kit and any other component considered essential, having a completely open space with easy access to the inter part. So the cleaning and the maintaining of the refrigerator becomes faster and more efficient. All our products, are manufactured with first choice materials and are certified according to the European standards with CE, and also with ISO 9001:2000.